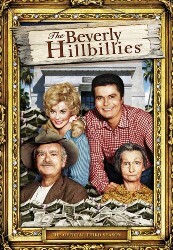 Plot Outline: Meet the Clampett clan - There's Jed, a kind and sensible man turned millionaire, though not as imbecilic as the others, things happen around him without he knowing it; Granny - old and senile, paranoid, and always certain she knows how to deal with a situation; Elly May - Incredibly beautiful but awful naive! And Jethro Bodine - the stupid nephew of Jed. He's a strong as he is dumb; and Mr. Drysdale, a greedy banker who will do anything to keep the Clampett money in his bank, even if he has to hurt other people. Anyway, they've struck oil, gotten millions of dollars, move into a giant mansion, but still live like hillbillies: they still dress in tattered ragged clothes with rope belts, and Granny still makes soap the old fashion way, and Jethro tries to woo the women with his manly ways, but he's actually only acting like a real idiot, and doesn't even realize it.